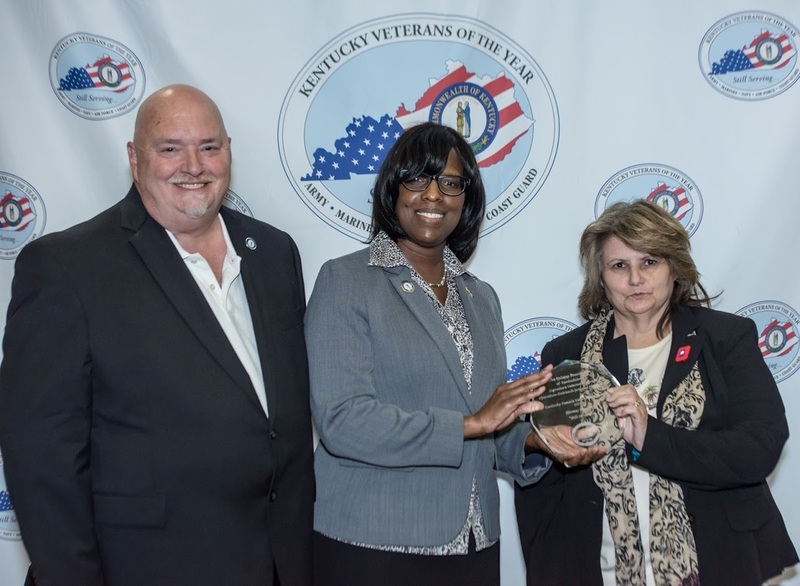 Assisted by John Mustain, Director of Veterans Outreach at the Epilepsy Foundation of Kentuckiana and co-founder of the Kentucky Veterans of the Year, Lieutenant Governor of Kentucky Jenean M. Hampton presents Stormey Vanover the award for the 2016 Female Kentucky Veterans of the Year. 2016 Female Kentucky Veteran of the Year. Stormey Vanover was nominated by Lorene Friedman. Here is the nomination Lorene wrote concerning Stormey. The nomination is unedited and unredacted. "Storme Vanover thrives on serving others. She served in the military and is currently serving in a different capacity for our Veterans and our community. She has been married to Jerry Vanover for 38 years; they have three children, six grandchildren and two great grandchildren. She worked in geriatric care for twenty years. She served on the Williamstown Merchants Committee for twenty years and served as president for five years. She spearheaded the committee to bring the Vietnam Wall to Williamstown, KY in 2013 and again this September, 2016. She coordinated raising funds for Christmas wreaths for Veterans interred in Kentucky Veterans Cemetery North. She is currently involved with a PTSD program. She is enrolled in military ministry classes through the Dave Reover Foundation. She volunteered to coordinate festivals for Williamstown when the job was downsized due to the economy and still serves as the Williamstown event coordinator. She is the current Adjunct at the American Legion Post 137 Williamstown, KY and is diligently working to bring the Post back to life. She is also serving as President of the soon to be chartered America Legion Auxiliary. She planned and presented an outstanding memorial in honor of the five soldiers from Grant County who paid the ultimate price with their lives in Vietnam. She has also started an on going Veterans’ Walk of Honor at the American Legion Post 137. She is currently serving on the Economic Development Committee for Grant County in branding and revitalizing downtown Williamstown."